This is such a wonderful, insightful article Ashen! I particularly enjoyed reading your take on the seven deadly sins, most especially “Sloth” and learnt (only today!) that it was once known as “Sadness.” Much here to reflect upon, thank you for sharing. Love and light, Deborah. Thanks Deborah. It’s amazing how these moral precepts survived. Even today’s societies suffer from the extremes of scapegoating and self-blame, both equally destructive. The same goes for the concept of Karma, which is riddled with superstition heaped on individuals and not seen in the wider context of the collective psyche. Aww, I just read it, so moving and so very beautiful! Thank you so much Ashen for pointing me in Hafiz’s direction today. Love and light, Deborah. If sadness be sin woe is me! Woe is me, too. One of the most congruent feeling to have. Perhaps now you might re-frame the corporal and spiritual works of mercy? You might begin by combining the two, ending the mind body split once and for all? Slightly tipsy tonight, after a garden gathering. What do you have to say about the mercies, any tips? I’m pleased you like H.I.K’s quote. It inspires. So insightful Ashen. I have experienced all at one time or another. For me, to be human is to be flawed and to experience all aspects of being human, I guess. But still there is something in me that finds a place of wanting to rise above it all. Sometimes I have glimpses. Thank you, Gillian. I’ll never cease searching. Our imagination keeps weaving narratives based on experience, and is boundless. Thankyou for shining some light on the underbelly of these imperatives of institutional Christianity. Given that perhaps the most fundamental imperative of the human heart is to feel belonging, including in the broadest and deepest sense of the term, it’s not difficult to intuit the desperate contortions and repression that go on in the attempt to convince the external world, including Superego (God), that one is “not guilty” of these “heinous crimes”, in the hope of being approved of, embraced and loved. Like a desperate, abandoned young child. It’s a vain, agonising, facade to impose on oneself…and on the world. A sense of belonging, yes, a basic need. Today it’s families of heart and mind we can travel alongside for a while. The caravans of dreams 🙂 The internet provides this for many who would otherwise be very isolated. Small is beautiful. Great exposition of the seven deathly sins of man, it brought some memories, as an anecdote I used to work in a business where our warehouse was named the Warehouse of the Seven Sins! Customers would park their cars on the back of the business right in front of our warehouse with the big sign, rarely a day would go by without a new customer, or more asking me intrigued about the seven sins, and what the warehouse was all about. Jokingly, I would tell them the place was a dungeon like place where the owner would perpetuate every sin on his new victims! And in fact the place was full of plasters from Paris, he bought a big truckload, by the thousands of replicas of the mysterious gallery of the chimeras, or gargoyles of Notre Dame, Paris, sometime after WWII. 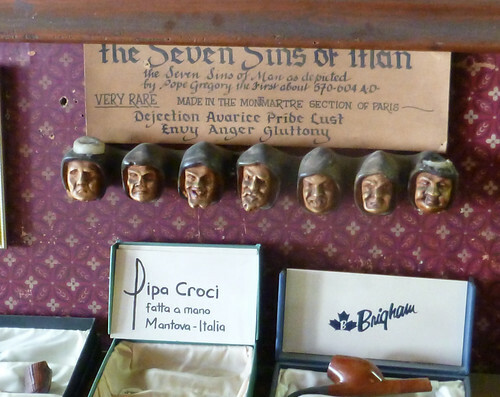 And when seeing, and reading the cardboard sign over the seven sins, countless conversations ensued about them. Most people would ask why dejection was considered a sin? Sloth, or Acedia It is the most difficult sin to define, and to credit as sin, since it refers to a peculiar jumble of notions, dating from antiquity and including mental, spiritual, pathological, and physical states. some consider the most accurate translation of acedia to be “self-pity,” for it conveys both the melancholy of the condition and self-centeredness upon which it is founded. Now day we can even call it depression, certainly not considered a sin today. My simple answer was to tell them, it was a sign you were not happy with the Will of God, therefore a major sin. I’m pleased you enjoyed my exposition. Unless we surrender to the greater will. Then again, unless this arrives as deep insight, what’s the use of prescribing it? Succinct, wise, beautiful. Thank you. So true. The sin of sloth is the one to ponder upon… The only good news is that God loves us, and every sinner has another chance. In seems to me that transgressions against any law have an evolutionary function, and whatever we project towards an ideal, we aim to manifest. Such a lot to ponder on. You’re right, we take words for granted. These seven sins, even for many who reject religion, underpin most of our lives, and yet have become so familiar that half the time we don’t notice them, let alone think about the deeper implications. This is a timely re-frame. Thank you for this. I need to settle down and read it again, and probably again after that. Thank you Cath. I’m pleased the post sparks contemplation.